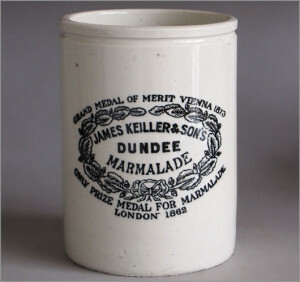 James Keiller & Son was influential in popularising marmalade, and was the leading manufacturer of the preserve in the world throughout much of the nineteenth century. Dundee in the east of Scotland, has a long history of fruit growing. Janet Keiller operated a small confectionery business at Seagate, Dundee from the 1760s. She produced jams, and modified a quince recipe to create “chip” (shredded peel) marmalade. It was believed that the addition of the fibrous orange peel aided digestion. Her son James Keiller (1775 – 1839) took over the business from 1797, and the firm assumed his name. Marmalade was just one of their many product lines, which included jams, cakes and confectionery. The firm was known as James Keiller & Son by 1827. Alexander Keiller (1821 – 1877) took over the firm from his father in 1839 when it was still relatively modest. Alexander Keiller was a warm but reserved man, with a steely determination. He moved the premises to Castle Street in 1845. He increased production with the introduction of steam-powered machinery. He employed 60 people by 1851. Keiller established a dedicated bakery department from the 1850s. 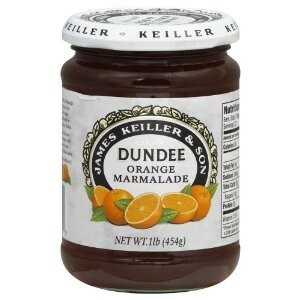 “Dundee marmalade” had secured a worldwide reputation by 1857. Keiller was already exporting, mostly to expatriates in countries such as Australia and South Africa. The Dundee factory employed an average of 150 people (mostly women), rising to 200 during the marmalade season. Nearly 15 tons of sugar were used every week. Jams, candied peels and confectionery were produced when Seville oranges were out of season. Alexander established a factory at St Peter Port, Guernsey for export manufacture in 1857. The Channel Island location was chosen to avoid mainland sugar duty. Managed by his brother William (1829 – 1899), for twenty years, the site accounted for one third of the company’s 1,000 ton a year output. Around 200 people were employed by 1878. However, profits were disappointing, and Alexander eventually bought out his brother’s third share in James Keiller & Son. By the 1860s, Keiller was filling millions of these earthenware pots every year. They were made by Maling of Newcastle upon Tyne. At a time when manufacturer’s adulteration of food was rife, Keiller invited The Lancet‘s food adulteration expert, Dr Arthur Hassall, to examine their marmalade in 1859, which he declared to be pure and “the finest he had ever tasted”. James Boyd (1848 – 1926) joined the firm in 1864. He was promoted to junior partner from 1874. Keiller was the largest confectionery manufacturer in Britain by 1869. Around 300 people were employed at the Dundee site. Following the death of his father, John Mitchell Keiller assumed control of the company from 1877. With the abolition of sugar duty in 1871, manufacturing offshore lost its rationale. The Guernsey operation was relocated to Tay Wharf at Silvertown, London from 1879. J M Keiller used the opportunity to oust his uncle William, and install James Boyd as manager of the new factory, where around 260 people were employed. Until the 1870s the jam was made with a 1:1 fruit to sugar ratio, and only the juice and peel of the fruit were used in order to maximise sweetness. The abolition of sugar duty gave preserve manufacturers the incentive to use all the bitter innards of the fruit, and simply increase the sugar content to compensate. This produced notable economies but decreased the quality of the product. It was not until the 1880s that Keiller was surpassed by Cadbury and Rowntree as the largest confectionery manufacturer in Britain. James Keiller & Sons became a limited liability company with a capital of £300,000 (£35 million in 2015) in 1893. J M Keiller used this juncture as an opportunity to step back from management of the business, and James Boyd became managing director. When J M Keiller died in 1899 his gross estate was valued at £521,000. He was the last Keiller to sit on the company board of directors. His son, Alexander Keiller (1889 -1955), inherited the entire company. The Silvertown factory was completely gutted by fire in 1899, with the damage estimated at over £100,000. 1,400 workers were temporarily thrown out of employment whilst it was rebuilt. The next year the Dundee factory at Albert Square also burned down, and was rebuilt at a cost of £30,000. The building, stock and machinery had been insured for £118,000. Keiller had a turnover of £350,000 by 1900. A German subsidiary was established in 1906 with capital of £150,000 and a factory at Tangermunde, near the sugar beet growing fields. James Keiller & Son had a capital of £400,000 by 1908, and company assets were valued at £443,000. Around 2,000 people were employed in 1914. Keiller was exporting millions of jars of marmalade and jam every month to British troops in France by 1917. In one year during the First World War 43,000 tons of jam and marmalade were produced. W M Mathew asserts that Keiller was the principal supplier of jam and marmalade to the Army. Alexander Keiller did not engage in management of the company, and sold his entire shareholding in 1918. Much of his stake was acquired by the Boyd family. James Keiller & Son was acquired by Crosse & Blackwell, the largest food processor in the British Empire, in 1919. Robert Boyd, managing director of Keiller, became chairman of C&B. The amalgamation gave C&B between 17 and 20 percent of the British jam market. Keiller continued to function as an independent concern with its own management, and only limited operations were merged. There were nearly 800 employees in Dundee in 1920. There were over 1,000 workers in London in 1922. Keiller was described as the largest preserve manufacturer in the world in 1921. The collapse of the post-war economic boom saw Keiller profits drop from £500,000 in 1919 to under £69,000 in 1920. Keiller announced a trading loss of £555,000 in 1921. The German subsidiary was liquidated in 1923, after debts owed to it failed to be repaid following the end of the war. A fruit pulping and canning operation at Wisbech, Cambridgeshire was sold to Smedley & Co of Evesham in 1923. Keiller marmalade production began at the Crosse & Blackwell factory in Vincennes outside Paris, France in 1925. A new bakery plant was opened at Mains Loan, Dundee in 1928. The glass jar with a metal lid was introduced for the UK market in 1928. The white jars were retained for export production. Keiller claimed to be the original inventor of the Dundee cake by 1929. Dundee cake was the highest selling line of the bakery division, followed by shortbread. Keiller supplied the King (marmalade) and Queen (chocolate) by royal appointment by 1931. Keiller gained a licence to produce Toblerone in the UK from 1932. All Keiller chocolate and confectionery production was centralised at Dundee from 1935, taking the number employed to around 900. The Albert Square factory was closed in 1947, and production was relocated to new premises in the city at Maryfield. Keiller operated a chain of bakeries around the Dundee area by 1946. Keiller opened its first retail shop in Blairgowrie, Scotland in 1948. Shortbread was the company’s highest selling export by the 1950s. America, the Middle East and the Far East were the principal overseas markets. Keiller preserves manufacturing was transferred from Silvertown to Dundee in 1952, leaving Silvertown to produce Crosse & Blackwell branded goods. Crosse & Blackwell was acquired by Nestle of Switzerland in 1960. Following the takeover of Chocolat Tobler by Associated Biscuits in 1967, Keiller lost the licence to produce Toblerone. Keiller had been overtaken by Robertson’s and Frank Cooper’s in marmalade, and by Hartley’s, Chivers and Wilkin in jams by the 1970s. Keiller was in the top six confectionery manufacturers in Britain in 1980, employing 320 people with a four percent market share. However sales declined, and Keiller began to lose money. The marmalade line operated for just one half day a week. Nestle announced plans to close the factory. Okhai of Dundee stepped in to acquire the company, with a reduced workforce of 145. Okhai transformed a site that had been losing £2 million a year into one that made an annual profit of £400,000. Export value increased from £500,000 to £4 million a year. 60,000 jars of marmalade were produced every day by 1985, and Okhai was awarded a Queen’s Award for export achievement. Barker & Dobson acquired Keiller for £4.9 million in 1985. B&D sold the Keiller preserves brand to Rank Hovis McDougall in 1988, who owned the Robertson’s preserves company, for £4.9 million. The preserves arm had employed a mere 14 staff, and production was relocated to the Robertson site in Manchester. Barker & Dobson sold its confectionery arm to Alma Holdings for £10 million in 1988. Alma relocated its headquarters to Dundee where it invested £8.5 million to transform the Keiller factory into one of Europe’s most modern confectionery plants. The high cost of borrowing saw Alma enter receivership in 1992. Keiller was the market leader in butterscotch at this time. The Keiller and Barker & Dobson brands were acquired by Craven of York for £3 million. The company subsequently renamed itself Craven Keiller. It was the third largest sugar confectioner in Britain after Trebor Bassett and Nestle. Craven Keiller was acquired by Cadbury in 1996, who spun off their sweets arm as Monkhill, which was later acquired by Tangerine Confectionery. The Keiller brand was eventually phased out, and now no confectionery bears the name. Keiller marmalade is produced by Hain Celestial at Histon, Cambridgeshire, for export only, to markets such as America, Australia and New Zealand.